Clan Kamizuru was once a noted clan of Iwagakure. Specializing in Bug Jutsu, specifically Hymenoptera. While they were on the decline the Kamizuru's mastery over their Insect techniques faded, though it did not stop them from producing powerful and skilled shinobi. In the Village Hidden in the Past they have managed to cultivate and restore their old skills, and are once again Insect Shinobi to be reckoned with. The Kamizuru clan are adept at their own form of insect control ninjutsu. Specializing in Hymenoptera their stinger equiped hoard are full of lethal venom and weakening toxins. One of the Kamizuru capabilities lie in the nature of insects they raise. The Honey Bee, at first while inadequate for offensive quickly becomes a Shinobi's strength. The honey they excrete at demand can be potent sustenance or a baleful malady to inflict upon the Kamizuru's enemies. Genin: +1 Hp/+1 Cp Regen, Clan Jutsu apply -1 to attack and defense rolls for 1 round, subsequent hits stack to -1 and extends duration by 1 round. Duration can only be extended once a round. Chunin: +2 Hp/+2 Cp Regen, Clan Jutsu apply -2 to attack and defense rolls for 1 round, subsequent hits stack to -2 and extends duration by 1 round. Duration can only be extended once a round. Jonin: +3 Hp/+3 Cp Regen, Clan Jutsu apply -3 to attack and defense rolls for 1 round, subsequent hits stack to -3 and extends duration by 1 round. Duration can only be extended once a round. Description: The Bee Keeper is a technique all Kamizuru of worth learn in their clan. 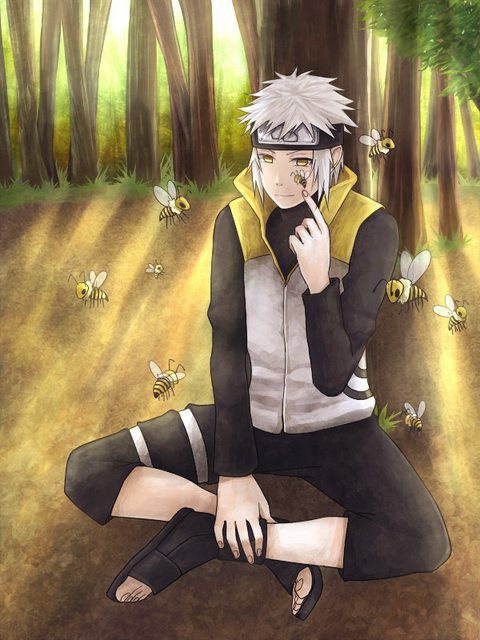 In it is the secret of controling the Bee's the Clan use to perform their Shinobi Arts. The technique, unlike the Aburame's uses a special type of summoning art that pertains only to Hymenoptera. Description: The Twisting Hornets Technique is one of the Kamizuru Clans trademark Ninjutsu Techniques. Using their Hijutsu the Kamizuru directs a stream of Hornets spiraling at their enemies. Description: Using their Hijutsu Kamizuru are capable of summoning a hoarde of bees to release their deadly poisinous stingers into their enemies. Description: Hachimitsu no Jutsu is one of the Kamizuru's more dangerous technique. As with most of their jutsu it has an extraordinary range. That coupled with the dangerous stingers of their insects and more so, the sticky chakra infused honey that the creatures are coated in make this jutsu a truly lethal attack if the swarm ever strikes. DF: Single Target, 1/2 Deals Rank Ninjutsu Damage + 2d6/2 (Rounded down) damage + stun (Physical) for one round. Cost: 14 cp per clone + 2 cp per clone per round. DF: Base Duration 1d6+1 rounds. Summons A Clone, May Summon 1 additional Clone per rank. For the duration of the technique, whenever the user is attacked they roll a 1d4 die, on a 3-4 the clone is hit. For each additional clone the dice upgrades by 2, Becoming 1d6 with 2 clones and 1d8 with 3 clones, each upgrade extends the hit range on a clone by 2, until 3 clones incurs a 1d8 roll with a 6-8 hitting a clone. Each clone that is destroyed reduces the dice and range by 2 again. Each Clone May use one tool or make one basic attack at 1 rank reduced damage per clone. (Original attacks at full damage, first clone attacks at 1 rank reduced damage, 2 clones at 2 rank reduced damage, 3 clones at 3 rank reduced damage). Whenever a clone is destroyed in explodes in Short range AoE. All within it must make a defense check vs users Wis roll or suffer 1 round stun (Physical). Description: The Vicious Wasp Swarm technique is the Kamizuru's most feared jutsu. It has the capacity to encompass large areas at once, and all those the Kamizuru deem enemy fall to the unending mass of vicious Bees and Hornets. Each sting a brutal and terrible fate as the venom spreads throughout the victims and destroys their flesh. DF: Enemy AoE, Rank Ninjutsu Damage + 1d7+1 rounds of 5 Poison Damage each round.